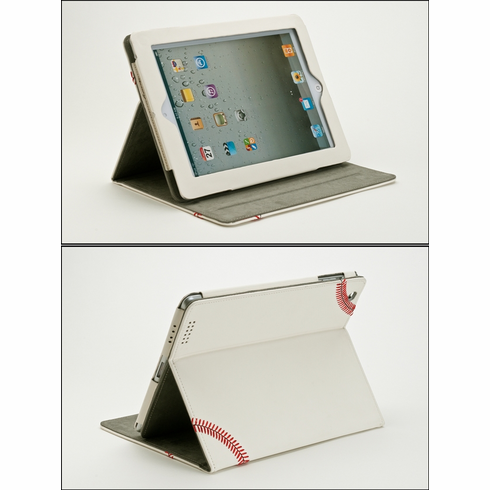 This baseball iPad cover features openings for all ports and buttons, so you can easily operate and charge your iPad without removing it from the cover. The camera openings let you easily use camera functions without removing your iPad from the cover as well. Magnetic closures keep your cover closed, and switch your iPad on/off! This iPad cover fits iPad 2 and 3 models, and should fit future models as well. Made with authentic baseball material - a really high quality synthetic leather that is durable and soft...very realistic looking and feeling. Embroidered stitches on exterior front and back. This iPad cover measures appx. 9 5/8" x 7 1/2" x 3/4" while closed. Click here to see all of our Baseball Material Gift Items!